During our stay in Fairbanks, we camped at two different spots (okay three, but Wal-Mart’s parking lot doesn’t count). In addition to the places we stayed, we scouted out some amazing spots that would be ideal for boondocking in Fairbanks – and they were free! The two spots at which we camped were both paid spots. This isn’t our ideal situation, as we prefer boondocking at free locations. However, sometimes convenience overtakes price and we decided to pay for a spot in town rather than camp where we didn’t have cell signal. After all, Mom was coming into town so we needed signal to make sure she was all in line (good thing we did that, because she missed her flight). The first cheap campsite in Fairbanks that we stayed was Pioneer Park. Pioneer Park is a centrally located park in Fairbanks. The city park has a little festival-style area that has games, rides, and park features. This is really a great area to take families for a fun time. It’s also right on the Chena River, making river access quite easy. We paddled the river and launched our boat just right there from the park! There are kayak and raft rentals available as well. Pioneer Park is $12 per night at the time we stayed. There are no hookups, but there is a water fill available when you pull in. There is a Tesoro gas station that has a dump for use if you fill up there. The gas station is off of Cushman Street. We saw some reports of WiFi, but that is incorrect. There is a signal being put off, but the signal is for the park’s communication devices, not for public use. Overall, the park is a good price for where it is located and how easy it is to access amenities in Fairbanks. We stayed at Pioneer Park for four nights. Note that their max stay is five nights. We didn’t see a need to stay much longer anyway, as it is a parking lot that you are camping in. Four nights was plenty for us to be able to explore Fairbanks and find a nicer campground to move to for the remainder of our stay. 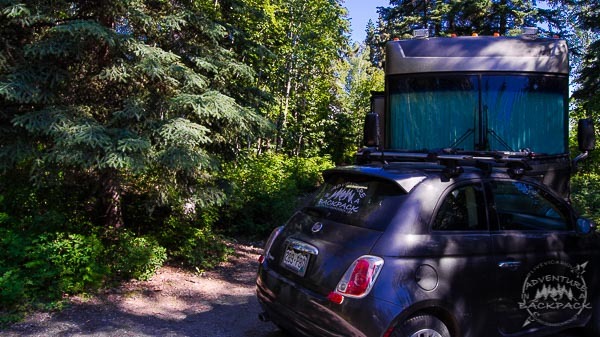 This is a good option for boondocking in Fairbanks for a short stay in town. 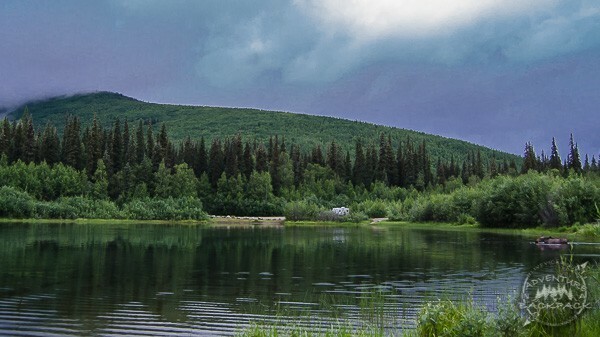 The campground that we moved to after Pioneer Park was the Chena River State Recreation Area. Again, this campground was very conveniently located in town, just about 5 minutes from the airport. While there are no hookups at this location either, it is very quiet and a beautiful site for just $20 per night. We stayed here for three nights while we wrapped up our visit to Fairbanks. 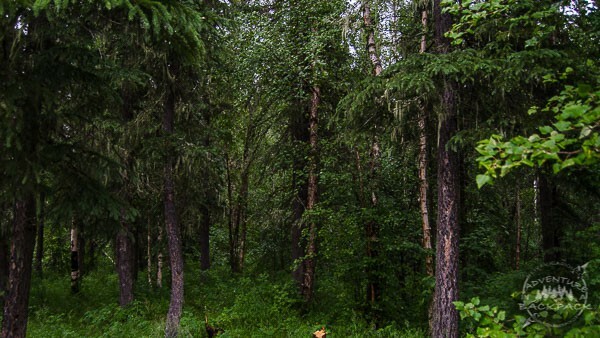 There are about 45 campsites available in the Chena River State Recreation Area. We were there the weekend before Fourth of July weekend, and not all campsites were taken. I imagine it was probably full on the holiday weekend. Regardless, it was a quiet area for being centrally located and a popular area. There is WiFi at this campground, but it is a relatively weak signal. Our campsite was the closest to the office that is offered, but we still had very weak signal. There is an office lounge area that you can come inside to connect to the WiFi if you can’t get the signal from your campsite. That’s a nice perk for an otherwise no services campground. 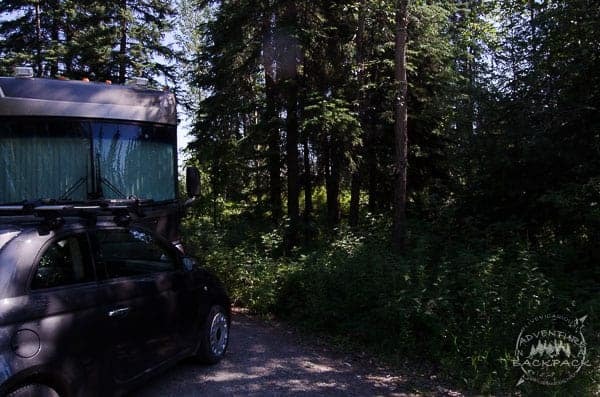 Although we ended up staying at paid campgrounds for the duration of our stay, there are options for free boondocking in Fairbanks and surrounding areas. Wal-Mart does allow overnight stays for free and actually has RV specific spots in their parking lot. We utilized their lot for one night while we got our bearings and stocked up on groceries. I will mention that there appear to be some RVs in the lot that have been there for quite a while. It’s nothing like the Whitehorse Wal-Mart, but it’s something to look out for at the very least. Be sure to never overstay and always clean up after yourself when using a Wal-Mart parking lot as an overnight. These are what we would consider “overnight stops” rather than camping. 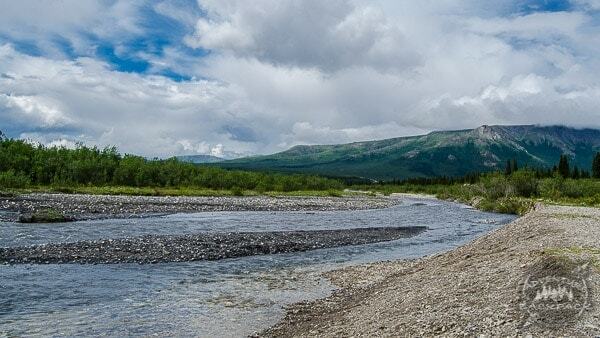 While we were out driving around, we scouted out some gorgeous campground areas on Chena Hot Springs Road. These are free campgrounds on state land. Although we did not stay at them, we thought we would share them for others’ information! Note that there are NO cell services at any of these sites, which is the primary reason that we decided against them. We did stop in at the BLM Field Office and the DNR Office to pick their brains on possibilities for boondocking in Fairbanks, but they were unable to point us in any particular direction other than the paid campgrounds. No worries, though, we scouted some places out for you! Going out on Chena Hot Springs Road from Fairbanks, mile marker 38.2 had a great pull out area with 4 or 5 camping spots. The road was gravel with a few pot holes, but we would have felt comfortable bringing our 38-foot motorhome down the road. It is a very short road and comes to a river access area that is spectacular. The forest around the area offers privacy and noise reduction from the adjacent highway. This would be a great place to hang out for a few days of peace and quiet and escape from reality. At Mile Marker 48, there is a sign for the 48 Mile Pond. Down this gravel road less than a quarter mile, there is a pond with 3-4 campsites around it. We drove Daypack (our Fiat) around the area with no problems, and it would be find to drive a larger rig into. It wouldn’t be easy to back out of, as it is not wide, but it is doable with some skilled maneuvering. 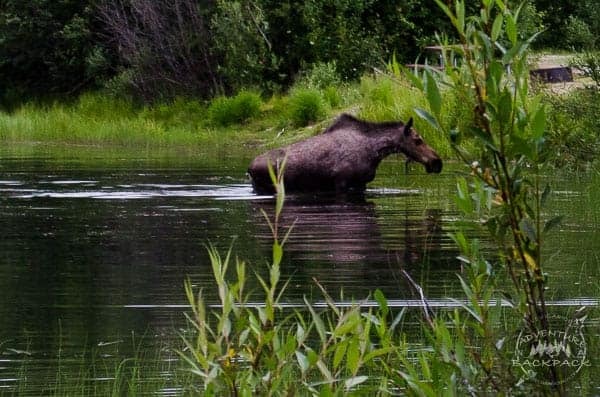 When we pulled in to scope out the area, there was a large cow moose munching on some grass in the pond! She was more concerned with her dinner than with us, and we were able to snap some great pictures of her! 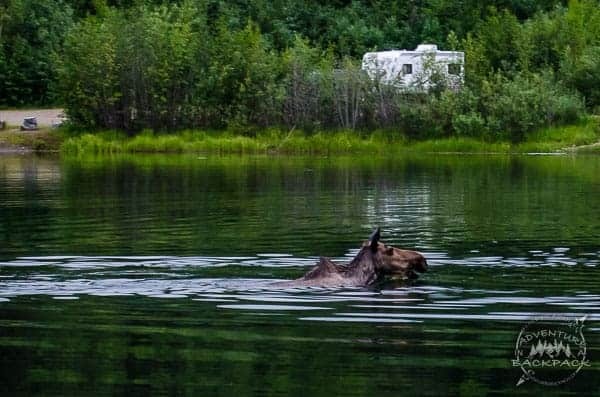 While we watched her eat, a camper pulled in on the other side of the pond and set up camp. This spot is absolutely gorgeous and would be a great place to spend some time. With no cell signal, though, it would be tough to stay for too long! 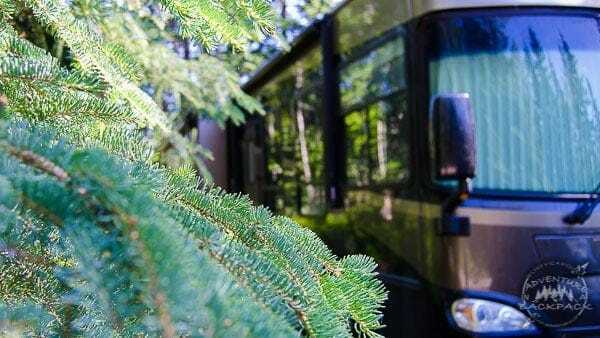 There are some really great areas for boondocking in Fairbanks and in the surrounding areas, but you just need to keep your eyes peeled! Down Chena Hot Springs Road after about mile marker 25 or so, there are several places that looked like good potential camping spots, especially for smaller rigs with higher ground clearance. We were still surprised at the places we found that were accessible to larger rigs as well! So if you are in the area and cell signal is not as important, drive around and scout some areas out before you pay for a parking lot! Let us know if you find more campsites in the area! We are always looking to help others out! And don’t forget to subscribe below for the latest updates in our adventures. Until next time, Live Vicariously! Great BDing info on Fairbanks and Chen Hot Springs. Thanks as we will be there in July/Aug. Thank you so very, very much! My father is very ill and lives in Fairbanks. Money is very tight for us right now but I must go take care of him. This information you’ve shared is a life saver!! As it will ensure my ability to care for both my family and my father’s needs. Thank you & God bless! I live and die by traveler blogs when I am out adventuring. I just landed in Fairbanks and needed a quick reference for out of the way camping and this is perfect. It is raining now, but I will head up to Mile Marker 48 later on today. Love this and thank you!! Glad to help! 😀 We hope you enjoy Alaska! Thanks, Stephanie. Love the blog, headed for Alaska from Yellowstone in June, 18. 38 foot class A, self contained. Hope to dry camp most of the way. Awesome, you’ll have a blast! Are you staying in Alaska long? Our 1 month trip was not long enough and we’ve been aching to get back there. Enjoy your trip!